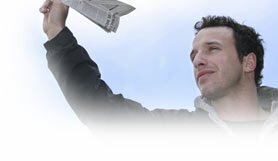 Interlink’s Advertising Billing software focuses exclusively on newspaper billing. As a result, it gets the job done far more effectively and efficiently than any ‘general purpose’ financial package ever will. Advertising Billing is a balance-forward system, making it easy to do summary billing at the end of the month and to post payments covering multiple charges. This is exactly how most newspapers bill their advertisers. Discounts publishers typically allow are handled as a matter of course–contract discounts, pick-up credits, agency discounts, contract rates, and volume discounts. The program automatically computes each one with no further effort on your part. Statements for several years (you set the number) are kept with your active records and can be viewed or printed at the touch of a key on a customer-by-customer basis. You have the advantage of a ledger-card system with the power of a computer. Advertising Billing manages transactions posted by month and provides the option to schedule ads and other transactions ahead of time. All reports offered by Advertising Billing are listed below. Ad Scheduling–Lists scheduled ads for a specified issue. This report allows several different layout options to provide forms for an ad build list, tearsheet, ad manager, and the page makeup department. Aging Report–Provides current aging information for all customers, past due only, credit, sales rep, current and past due, or non-zero. Commissions Report–Provides a list and total for all transitions assigned to a Sales Rep so that commission can be calculated. Co-op Bills–Similar to the invoice report, Co-op Bills prints a bill for each qualifying advertising transaction for use in redeeming Co-op advertising rebates. Customer Activity–Lists all current or historical activity for customers along with the balance for the time period selected. Customer List–Lists all customers. Several selections are available making it possible to print by sales rep, contracted customers, agency customers or customers with activity for the current month. Invoice–Prints an Invoice for selected transactions or customers prior to the monthly statement. Invoices are used for immediate billing of an ad and can be sent with the monthly statement to companies which only pay from an invoice. Old Address Lines–Lists address information that could not be imported into the address record when converting from earlier Interlink Ad Billing software. Statements–This report provides a statement of all transactions for the customer entered during the month selected. Statements can be printed, or reprinted for any historical month. Transaction Definition–Lists each pre-defined transaction. Pre-defined transactions are used as templates to speed up the entry of charges and credits. Transactions Summary–Lists all transactions posted during the selected month with grand totals for each transaction type and a grand total for all activity during the selected month. Ad Scheduling allows transactions to be scheduled ahead of time. All current activity for customers is listed on the screen in “real time” so when customers call it is easy to give them an up-to-date status of their account. On-screen help documentation and context sensitive help assists in using the program and provides the most up-to-date information when changes are made to the program. Report output modes allow a report to be viewed before printing or printed directly. Maintains up to 99 separate business record sets, with each set holding up to 9999 individual clients. Posting Transactions is a one-screen function, making it easier when posting several transactions in a batch. Scheduled Ads can include all transaction information so when the issue closes, the charges are automatically posted. All data contained in Interlink’s historical Ad Billing software can be imported automatically into AB4. This includes customer history and all pre-defined transactions. Interlink Advertising Billing software runs on Windows PCs using Windows 7 or newer. Macintosh computers are not compatible with AB 4 software. Any printer compatible with Windows 7 or newer can be used with this program. This includes dot matrix, laser, and ink-jet printers. Printing multi-part forms will require an impact (dot matrix) printer. AB4 is a single-user program, but can be accessed over a network from a server. Interlink Ad Billing software is licensed on an annual basis. Your fee will be determined by your demands, based on frequency of publishing and size of your publications as measured by their circulation. The goal of sliding-scale fees is always to minimize fees through pricing that makes it possible for the largest number of publications to use the software. And while increasing frequency and circulation may result in higher overall fees, fees per copy always go down. We would be happy to provide a personal quote so please email us at sales@ilsw.com or call (888) 473-3103 to speak with a sales manager.